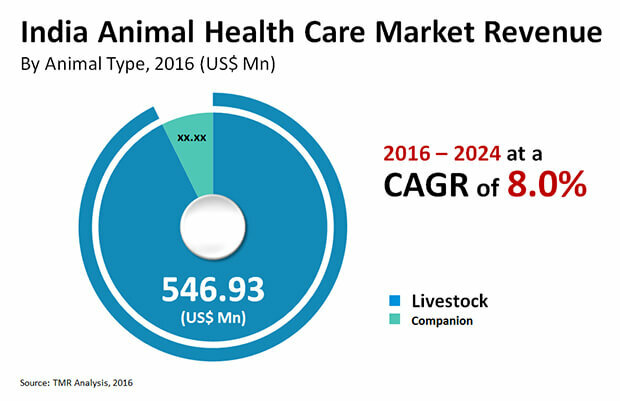 The animal healthcare market in India is characterized by stiff competition among the following players – Merck and Co. Inc., Zoetis Inc., Elanco, and Merial Animal Health. These companies are seen pulling out every stop to bolster their positions – they are upping spends on product development to launch new drugs and vaccines for animals. However, since it has proved to be an expensive bet with limited returns, savvy players are now eyeing strategic mergers and acquisitions to grow their shares. This might lead to market consolidation in the near term, predicts a report by Transparency Market Research. The TMR report finds that the market would rise at a 8.0% CAGR over the course of the forecast period starting from 2016 and ending in 2024. Rising at this pace, the market which was worth US$0.59 bn in 2015 would likely become worth US$1.17 bn by 2024. The overall market for animal healthcare in India can be broadly segmented into livestock and companion. Between the two, the segment of livestock animals account for greater market share and going forward too is expected to retain it because of the growing threat of animal-borne diseases and the subsequent need of diagnosing and treating those early on. Region-wise, the key segments of the animal healthcare market in India are East India, North India, South India, and West India. Among them, South India currently leads the market with a substantial share because of the high consumption of animal protein there. The trend of adopting animals as pets in the region has also stoked the market. Karnataka and Andhra Pradesh are mainly serving to drive the market in South India. Animal husbandry substantially contributes to the GDP in India. This is because agriculture used to be the mainstay of the economy up until a couple of decades back. Rural people and even those in urban suburbs depend upon cattle such as cows, buffaloes, and goats that provide milk and meat for their livelihood till today. But with growing thrust on quality of animal products and big and small companies entering the domain, animal husbandry has become technology driven. This in turn has led to a lot of emphasis on controlling outbreaks of new and old animal diseases. As a result, the animal healthcare market in India has seen an upswing. One challenge, however, which the market needs to overcome is the strict regulatory framework regarding the usage of antibiotics and high treatment costs. Despite such challenges, it will likely remain on a steady growth trajectory because of the surging demand for antibiotics, dewormers, analgesic drugs, and other advanced animal healthcare products.